It’s already been quite a week… and it’s only Wednesday. On the bright side of things, I’ve had some experimental recipes turn out really well, like these no-bake brownies pictured below. On the down side, both of my kids woke up with runny noses last weekend (thank you, preschool). I forgot how hard it is to help a baby sleep when she can’t breathe through her nose. I don’t know about you, but when I drink coffee I also like something sweet to go with it… which is probably why I shouldn’t drink coffee too often. At the moment I only drink decaf, because I’m still nursing, so it’s really only for comfort, not for actually keeping me awake and energized. Fortunately, before all of this sickness struck our house, I did about an hour’s worth of meal preparation on Friday. I’m seriously appreciating that brief effort this week, because I’ve got lots of easy salads in my fridge, make-ahead smoothies, and even some treats. I’ll admit that I reach for sugar too much when I’m tired, but I figure this, too, shall pass and it will all balance itself out eventually when I’m a bit more rested. Snack: I’ve been trying to shoot more recipe videos lately, so I had some Vegan Flourless Chocolate Cake sitting around in my fridge… which is dangerous when I’m tired and drinking a lot of coffee. I snacked on a rich slice as my mid-morning snack, and it was totally wonderful and decadent. Lunch: I made a batch of Quick & EasyVegetarian Bolognese in the Instant Pot the night before, so I’ve got lots of extra sauce and spiralized zucchini noodles (I use this spiralizer) in my fridge for easy lunches this week. To reheat, I just pour a portion of the bolognese into a small saucepan over the stove and heat it until it’s piping hot. Then I add in the cold noodles and stir just for a minute, so that the zucchini noodles get warm, but not mushy. Sometimes I serve this with a sprinkling of parmesan cheese– just depends on my mood. Snack: I usually make my baby another smoothie in the afternoon, so I make one big enough that we can share. If my son is home, the shake has to be “yellow” because he’s on a yellow-kick. Ha ha. So, this one was banana, mango, pineapple, avocado, and a splash of orange juice. Any extra smoothie we have, I save to make healthy popsicles! Dinner: Thanks to the Make-Ahead Reset, I had already prepared the salad and dressing to make my Trader Joe’s Knock-Off Southwestern Salad. We topped it with some chicken I had cooked in the Instant Pot earlier for an easy dinner. I’m pretty sure I snacked on a couple pieces of dark chocolate in the evening, too. Trader Joe’s came out with a cold-brew coffee bar that is insanely good, so Austin and I have been sharing that with some hot tea or decaf coffee while we work on our own projects in the evening. Reader Feedback: What are YOU eating this week? 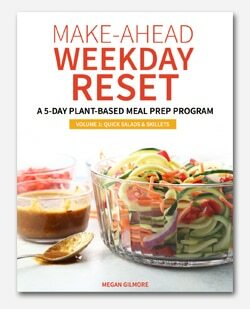 Any fast and easy meals you want to share? Hey Megan, just a suggestion if you or your kids are still having sleeping trouble due to congestion, or the next time a cold makes its way through your family: the sock trick! Here are the instructions, and lo and behold, it works amazingly. And it’s SUPER simple and can be used even on a baby. Here’s to full nights of rest! love it! i’m going to start prepping more veggies like you do. generally speaking, i almost always cook our meals, or have them pre-made and stored in our deep freeze, but every now and then, particularly when my husband is out of town on business, i take shortcuts. things like store bought freezer meals are awesome because i can usually throw in a puree in with the sauce (they are too salty on their own and lack veg… but they are a great base to adding in more stuff). then i throw in whatever is in fridge and freezer. i like it because i don’t have to think about it and clean up is really fast. pizza is another… get a store bought pizza and stir fry extra onions, bell peppers and mushrooms to throw on top. if you buy something with rice in it, throw in some frozen cauliflower rice, etc. my main agenda is trying to get in as many vegetables into something as possible. Question: when prepping for smoothies, what is your rule of thumb of how much a person eats? how much per person/child do you prep for a smoothie? I truly love your “What I Ate” posts so much! I love your recipes and drooling over your gorgeous photos but sometimes get discouraged when my food doesn’t look like yours. 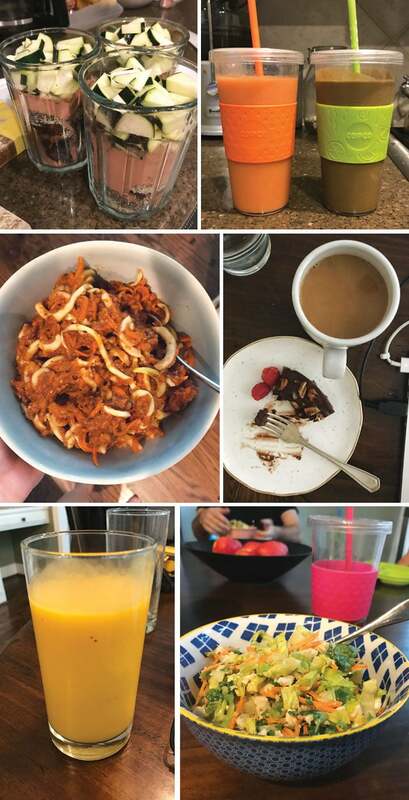 Your “What I Ate” photos look like real food and it keeps me so inspired! 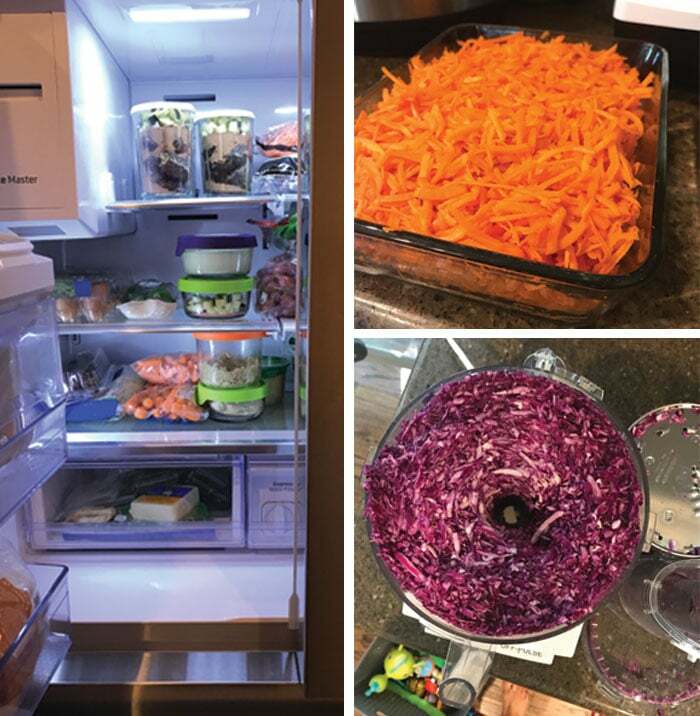 I especially like the inside look of your fridge and although I’m not the best at consistent meal-prep just yet, you keep me continuously inspired that healthy living/eating isn’t impossible or for those with tons of time on their hands. It can be done! I’m just very grateful for you sharing your life and journey. Thank you! It depends on the coffee, because some versions I prefer drinking black, but yesterday I did add a splash of real whipping cream. When I am drinking coffee regularly, I usually keep a jar of homemade Almond Milk Creamer ready in my fridge. 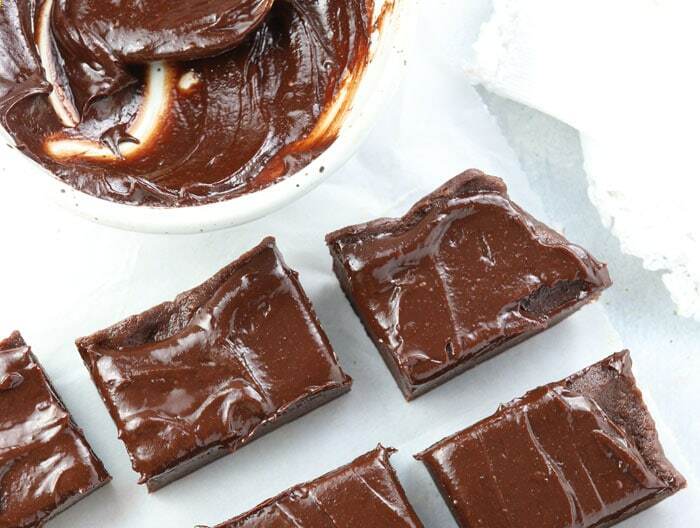 The brownies at the top of your post look delicious. Will that recipe be posted soon? You inspired me to make a smoothie for work tomorrow morning. Hope your little ones are feeling better. Yum those brownies look so good! Can’t wait to see the recipe. You are still doing so well at eating healthy despite the challenges. Way to go!